Happy Tuesday kitty cats! It the last 2 weeks to join the Cat Pack in this months challenge of Summer. Of course, there are so many ideas of what you can create to play along in this challenge. And there are so many adorable sets in the TCP store perfect for it as well! For me, Summer always includes the beach, so that is exactly what I needed to create. 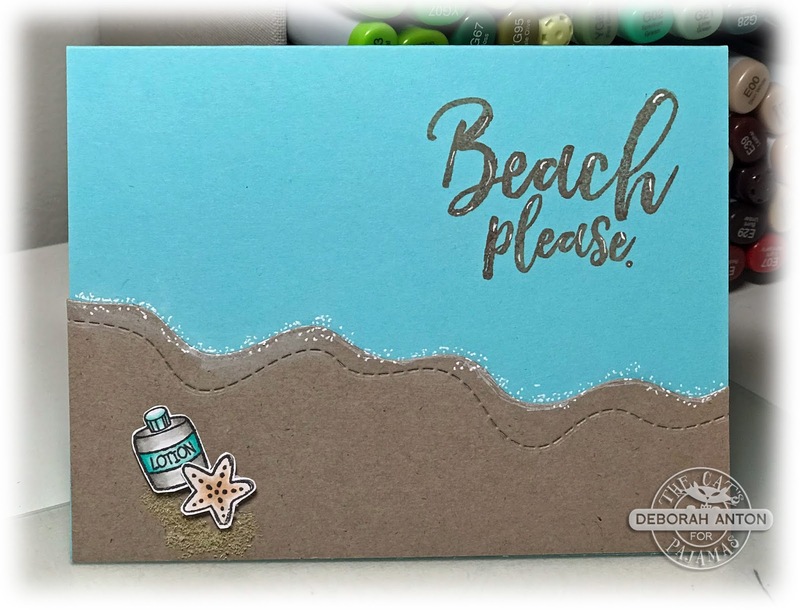 For my card, I am using the Beaches Cut Ups and some images from the newly released set of Penguin Summer. After cutting out the images to be popped up on the beach, I added some Flower Soft "Sand" around them for an added element. The sentiment was stamped directly onto the card base and some white accents added to the letters using my white gel pen. Using that same pen, I added some look of beach foam along the edges of the sand. Simple and makes me want to head to the beach. Be sure to check out the other fabulous creations from the Cat Pack on the blog and link up yours for a chance to win! Thanks for stopping by and have a great Tuesday!